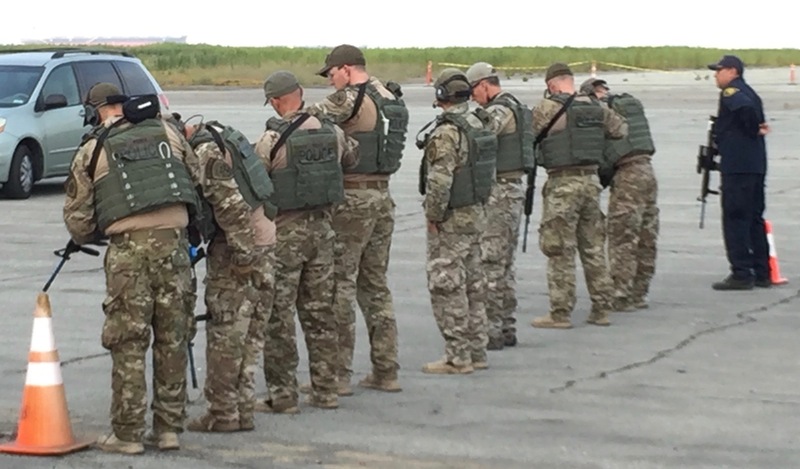 On Sept. 9, the tranquility of the remote shoreline on the federal property at Alameda Point was interrupted by participants firing blanks as an Urban Shield police tactical team staged a mock hostage rescue. The gunfire was part of the emergency preparedness training that was performed in an area the U.S. Department of Veterans Affairs (VA) agreed not to use for this purpose. 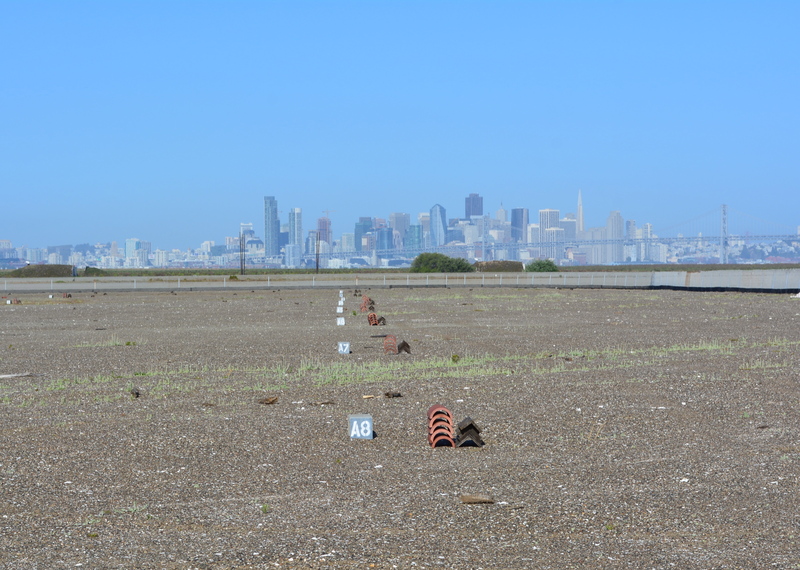 A legacy of disappointment continues on the aircraft runway area at Alameda Point. In the nearly 20 years since the Navy ended operations there, the community has lost 74 acres of open space that was once slated to become city property. The community has also lost the possibility for a 550-acre national wildlife refuge and a state-of-the-art community hospital to be run jointly with Alameda Healthcare District to serve veterans and non-veterans. U.S. Department of Veterans Affairs (VA) plans for outpatient clinic, medical and benefits offices, and a national cemetery at Alameda Point. San Francisco in background. 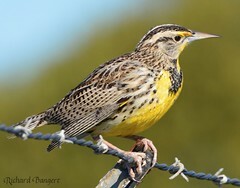 The only recent expenditures on the 624 acres of federal property, now owned by the Department of Veterans Affairs (VA), have been to fund landscaping over an underground dump and the management of the endangered least terns that nest on 10 acres, which includes the widespread application of herbicides and vegetation removal on 300 acres of pavement at the direction of the U.S. Fish and Wildlife Service. 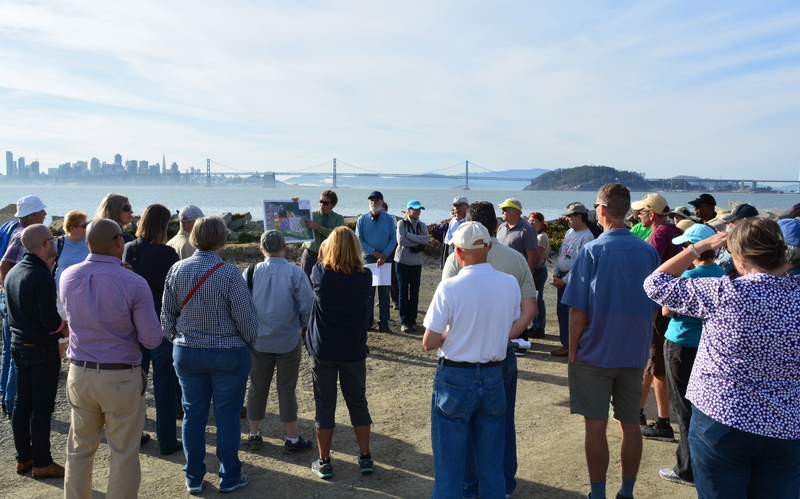 Around 50 people took part in the first city-sponsored tour across the old naval airfield to the western shoreline of San Francisco Bay on Monday, Oct. 26. The convoy of automobiles stopped near the future site of the Department of Veterans Affairs (VA) clinic and at the shoreline next to a restored 30-acre wetland site. The wetlands are located within the Navy’s 100-acre cleanup site known as Site 2. Tour group at the western shoreline listening to Dr. Peter Russell explaining environmental cleanup work the Navy has completed at Site 2. While Site 2 has been known for the past 18 years as a mysterious off-limits environmental cleanup site, most of the visitors on Monday’s tour seemed more interested in the area as a scenic viewing site. 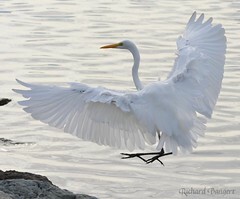 Despite the sparse showing of birds on the wetland during the visit, the group appeared awed by the vast expanse of land, water and sky that surrounded them as they stood on the embankment overlooking the wetland and the Bay. 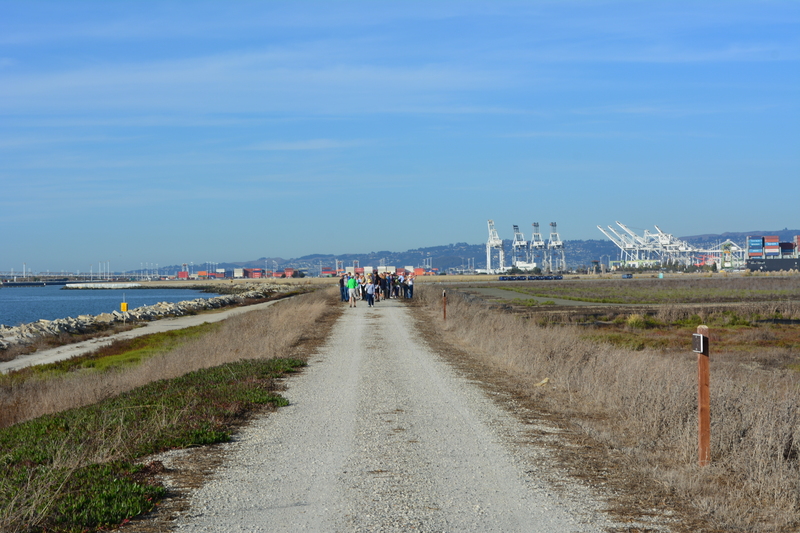 View of the trail on embankment, with tour group and Port of Oakland in the background. Wetlands are to the right. San Francisco Bay is to the left. A future leg of the San Francisco Bay Trail will eventually pass between the wetland and the shoreline, with views all the way to the Golden Gate Bridge on a clear day. The state’s Bay Conservation and Development Commission requires the VA, via its shoreline authority, to grant an easement to the city for construction and operation of the trail. No date has been set for when this process will begin. During the stop near to the future VA clinic site, Jennifer Ott, the city’s chief operating officer for Alameda Point, informed the group about the public roadway, including underground utilities, that the VA is going construct leading to the western shoreline. The roadway will provide public access and utility hook-ups for city-owned open space property along the Oakland Estuary. The group parked at the western shoreline where the future observation point and trail access parking lot will be located at the end of the road. Tour group listening to Jennifer Ott explaining plans of the US Dept. of Veterans Affairs while stopped next to future clinic site. San Francisco skyline in the background. The tour was arranged at the urging of Vice-Mayor Frank Matarrese. Also in attendance was Mayor Trish Spencer. Another view from the stop next to the future VA clinic site. Small wetland in between runways can be seen in the background. 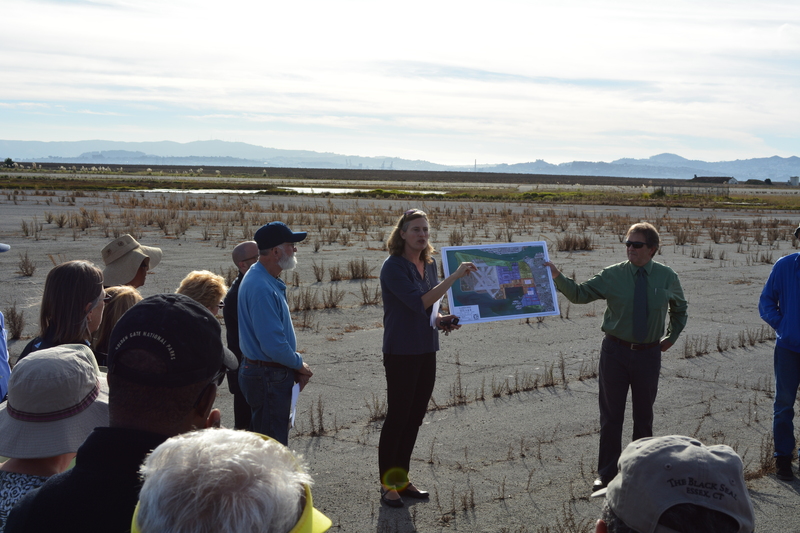 VA is expected to enhance the wetland, which remains covered with water in the middle of the airfield despite a drought. The Navy still retains some responsibilities at Site 2 — namely, for ensuring that the grassland vegetation on the landfill soil cover is successful. Jennifer Ott answering questions at the western shoreline. This location is where the VA’s future road will end, with a small parking lot, benches, and access to the Bay Trail. “Seeing the wetlands makes me want to accelerate our wetlands efforts on city property,” said Matarrese. The annual tours to the least tern colony at Alameda Point were sold out again this year. Three groups totaling about 100 people listened to a presentation about the endangered birds before boarding a bus at the Crab Cove Visitors’ Center. It is the only time that the general public is permitted to enter the federally owned former aircraft runway area to view the terns nesting. Guests are not allowed to leave the bus. Least tern tour bus parked next to the nesting area on former Navy airfield. San Francisco is in the background. This once-a-year glimpse of Alameda’s colony, managed by the U.S. Fish and Wildlife Service (USFWS), is very different from the daily opportunities to view the Huntington State Beach least tern colony near Los Angeles, managed by the California Department of Parks and Recreation. The 9.6-acre Alameda Point least tern nesting site has a 500-acre buffer zone. 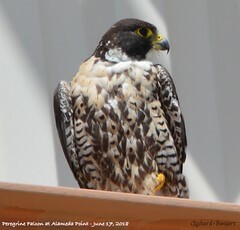 During the nesting season, volunteers monitor and record tern behavior and threats from predators, such as hawks and falcons, while sitting in their vehicles. 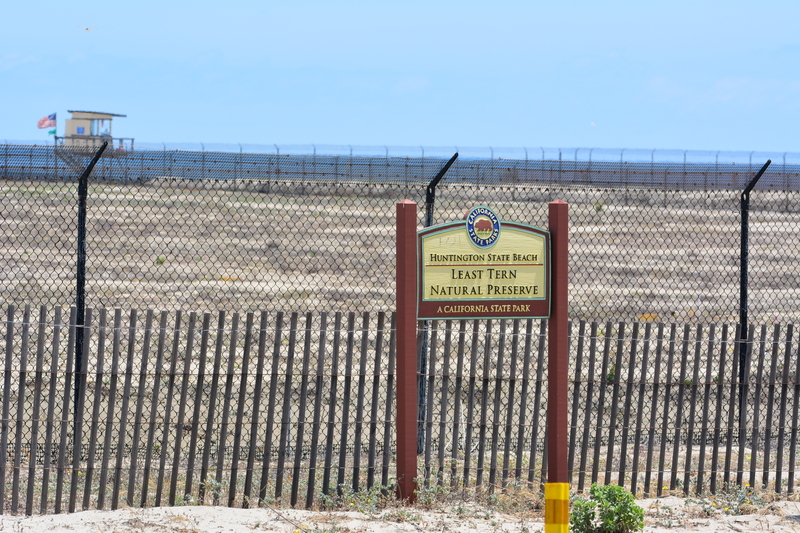 The 13-acre Huntington State Beach Least Tern Natural Preserve is protected by a 15-foot buffer zone on three sides. The Huntington Beach Bike Trail hugs the fourth side of the colony, with the busy Pacific Coast Highway only 40 feet away. Huntington Beach Bike Trail. Least tern preserve is on the right. Pacific Coast Highway is about 20 feet to the left and out of view. City of Newport Beach is in the background. At Huntington State Beach, docents amble around to educate visitors about natural history and conservation while recording observations about predators. 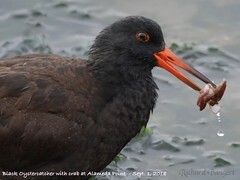 Over the recent Memorial Day weekend at Huntington Beach, people casting fishing lines into the ocean, throwing Frisbees, and laying on blankets were often not more than 30 feet from adult least terns loafing and sometimes mating on the beach. Visitors to Huntington Beach viewing the least tern nesting activity on Memorial Day weekend 2015. 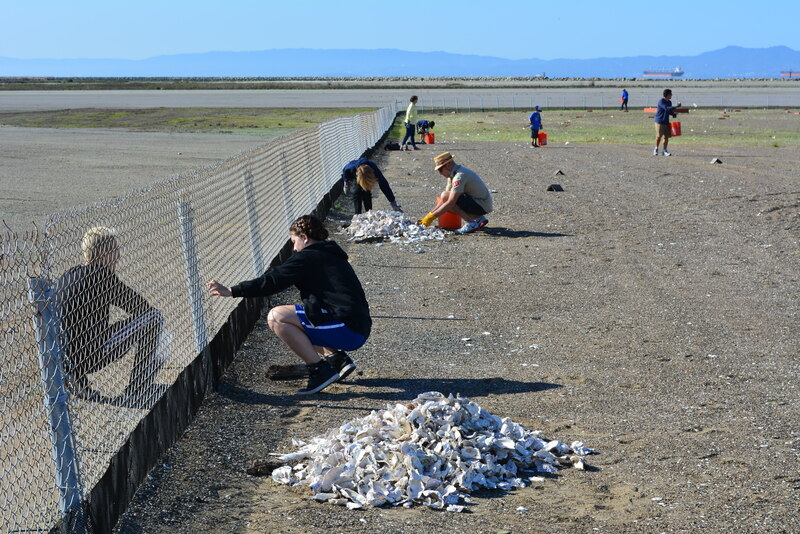 During the non-nesting season in Alameda, volunteers remove weeds by hand, and pick up terracotta tiles, wooden A-frames, and oyster shells used for sheltering the chicks, and then re-distribute them in April before the terns arrive. USFWS sprays an herbicide before the terns arrive to minimize vegetation that sprouts up on the bed of imported sand. This is to help to maintain the look of a beach with good sight lines preferred by terns. At the Huntington Beach Preserve, the state park department stopped using shelters. They, too, use an herbicide, but only for grasses. The low-growing flowering vegetation on this natural beach is allowed to remain and serves as camouflage for nesting adults and for the chicks when they hatch. Least tern sitting on eggs at Huntington State Beach. The nest is simply a depression in the sand. The vegetation is not part of the nest. At Huntington Beach, certified volunteers count the nests, eggs and chicks twice a week. They walk through the site inside of sand-colored canvas blinds held together with PVC pipe that they carry. At Alameda Point, the wildlife biologist does not employ the use of a blind. The Huntington State Beach Least Tern Natural Preserve was established in 1973 as the first fully protected tern colony in California. This preserve implemented the central tenet of the USFWS-approved recovery plan for the least tern by providing a well-defined nesting site that is secure from casual disturbance, primarily by human recreational activity often accompanied by canine companions. 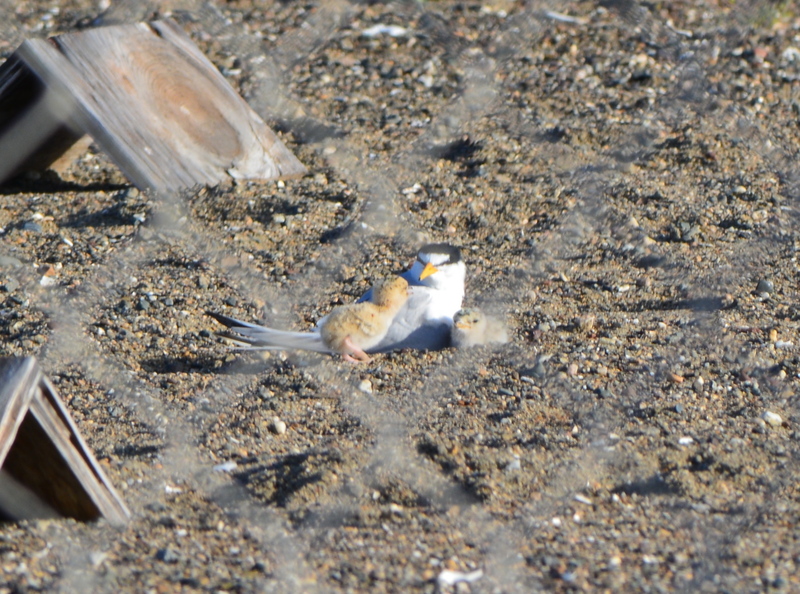 The wisdom of this practice is illustrated at Alameda Point: No least terns have ever nested outside of their fence. The two other determining factors in the breeding success of the terns are the presence of small fish in nearby waters, which can vary due to climate and current, and the presence of predators, which can vary by location. No scientific formula exists to prescribe how far away human activity must be for successful nesting of the terns. 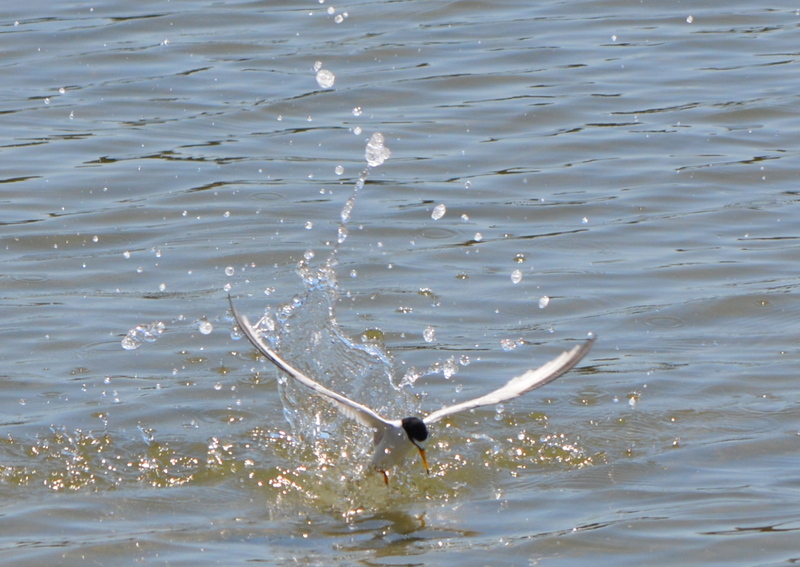 Least tern diving for fish in Alameda Point’s Seaplane Lagoon on June 7, 2015 during the nesting season. Dragon Boat races were occurring nearby. 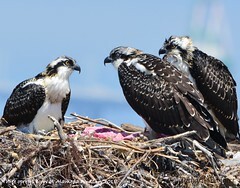 This year, as of June 20, there were 500 nests at the Huntington Beach Preserve. Alameda Point had a count of 315. 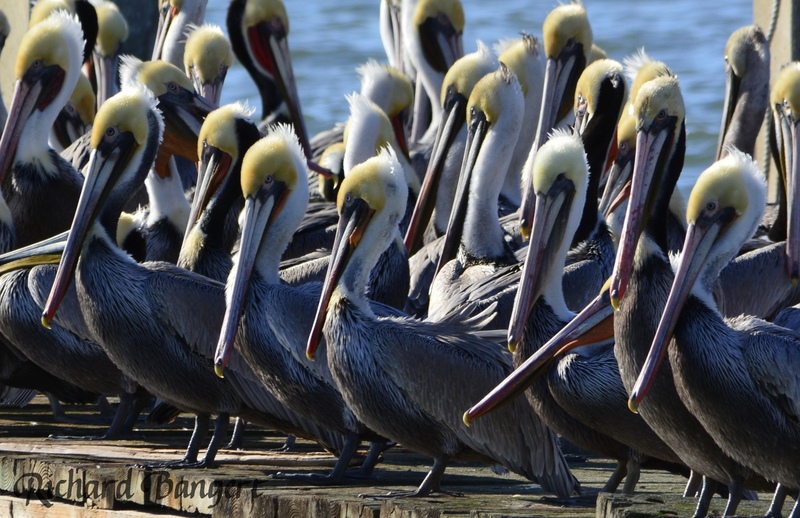 There are 27 sites in California that had 10 or more nesting pairs in 2014. Both Alameda Point and Huntington Beach typically rank in the top five. Huntington Beach least tern nesting news updates are posted on the Sea and Sage Audubon Society website. There are no published news updates or progress reports about Alameda Point least tern nesting activity. The annual Alameda Point “Return of the Terns” tours happen every June. Least Tern Preserve with lifeguard tower in the background on the beach. 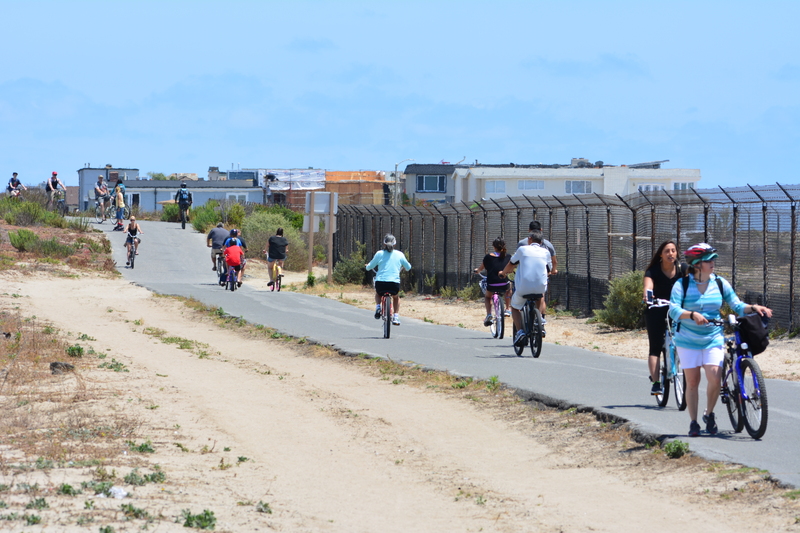 Cyclists on Huntington Beach Bike Trail on Memorial Day weekend 2015. Huntington Beach Bike Trail at the bridge over the Talbert Channel. Least tern on nest. Vegetation is not part of the nest. Recording observations about the number of nests, eggs, and chicks. Recording data in the nesting area. Least terns on the beach. Least tern male with fish in mating posture. On the beach outside of nesting area. Talbert Channel, with Least Tern Preserve in background. Huntington Beach, with Least Tern Preserve in background. Santa Ana River. Newport Beach on the left, Huntington Beach on the right. Side channel in Santa Ana River where the terns bath and hang ot. Parking lot next to Least Tern Preserve. Bike trail runs between parking lot and tern preserve. Main beach area is to the right. Sign on fence at Huntington Beach Least Tern Natural Preserve urging people to stay 15 feet away. Boy Scouts and Cub Scouts were helpful in getting the least tern nesting area ready for the 2015 season. 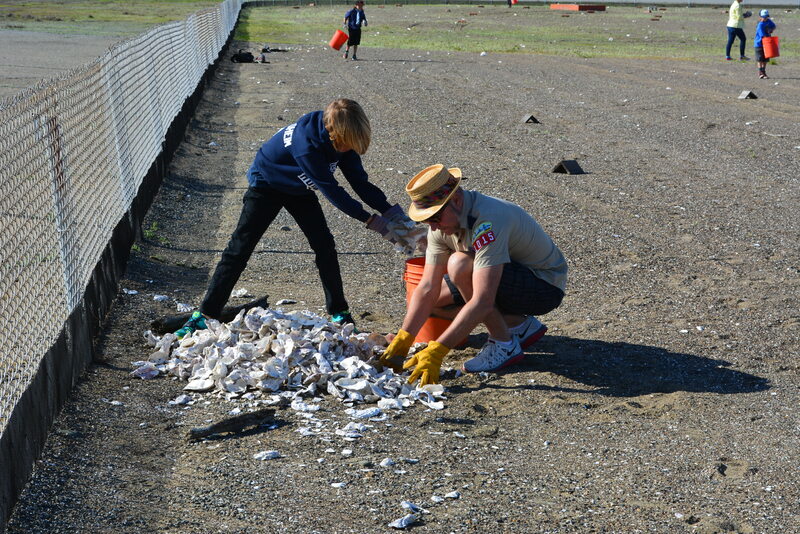 Cub Scouts distributing oyster shells around the nesting area for the least terns. Fifteen boys from Cub Scout Pack 1015 and three boys from Boy Scout Troop 73, along with 18 parent volunteers, came out to the least tern nesting area at Alameda Point on Sunday, April 12. They joined a dozen students from UC Berkeley’s Tau Beta Pi fraternity, and five students from Oakland School for the Arts’ Club Impact and Empowerment. The volunteers put out oyster shells and tern shelters, made fence repairs, and trimmed weeds. It was the final work party before the terns arrive later in April to begin nesting. Piles of oyster shells. Two students mending plastic mesh fencing to keep chicks from wandering through the chain link fence. 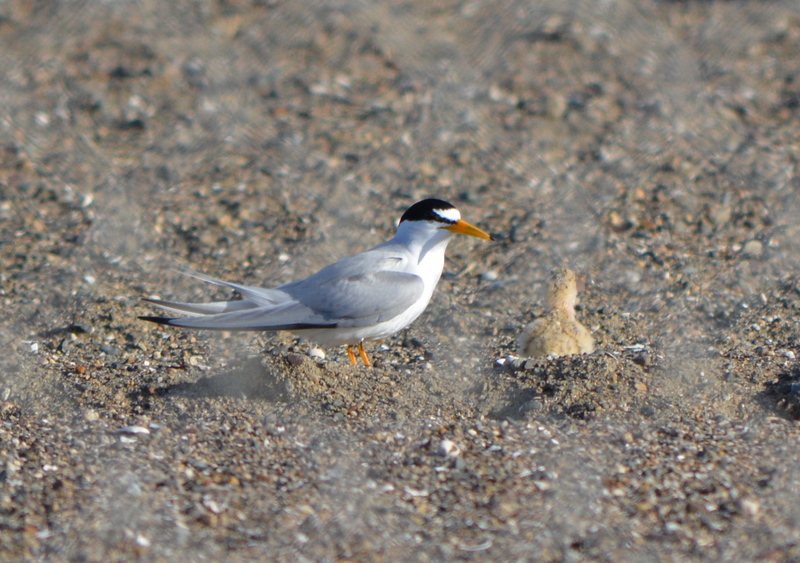 Least tern adult with chick sitting in a depression in the sand in 2014. When asked what they liked most about their day of volunteering, Dash, age 9, said, “Digging up all the weeds! 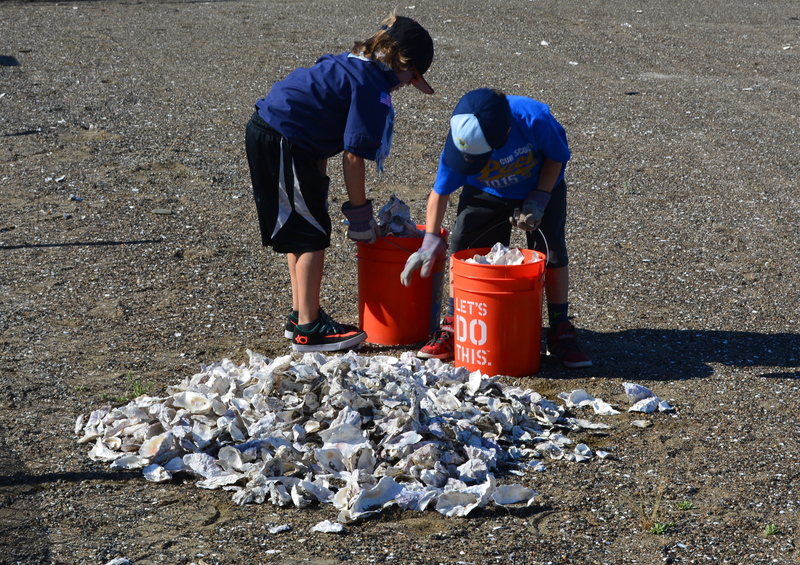 We did a lot of work but that part was fun!” Will, age 8, said, “I liked putting out the oyster shells the best because the little baby birds will now be protected. Also we saw a big spider!” They also saw some crickets and fence lizards. “The boys felt a big sense of accomplishment being part of the conservation project in April,” said von Stroheim. “It was great to see how even these young boys age 8-12 could contribute in a meaningful way to the work. The parents also enjoyed getting to be part of such an important Alameda project.” The Elks Lodge in Alameda sponsors Cub Scout Pack 1015. The public will have an opportunity to visit the site on Saturday, June 20. The annual Return of the Terns bus tours leave from the Crab Cove Visitor Center on McKay Avenue following a presentation. Tour times are 11 am, 12:15, and 1:30. 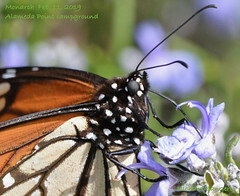 Registration is required via the East Bay Regional Park District’s website. The cost is $11 for adults or $9 for youth (over 8 years). 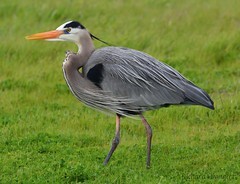 The tours are co-sponsored by the East Bay Regional Park District and Golden Gate Audubon Society. Published in the Alameda Sun. Volunteers at work. Looking south. The view toward San Francisco at the start of the volunteer work day. Lettered and number cinder blocks are used to record nesting activity by a grid system. Tiles and A-frames were spread around the site for use as shelters. UC Berkeley students trimming tall pampas grass near the nesting site. 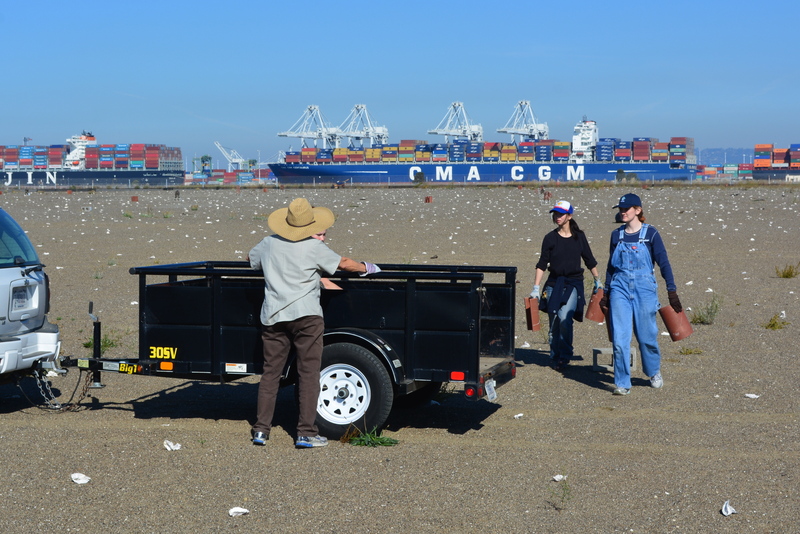 Volunteers at the Alameda Point nesting site of the endangered California Least Tern continued their efforts this fall after a successful 2014 nesting season. 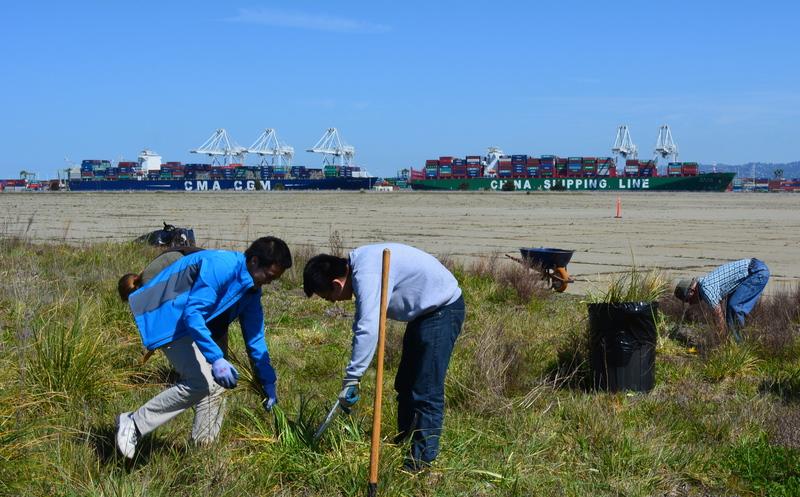 Tau Beta Pi members help out during the November 2014 work party. Port of Oakland in background. The Alameda Point colony produced over 350 least tern fledglings this year, and a record number of the nests had three eggs, as opposed to the usual two. 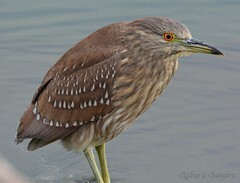 The 45 nests with three eggs may be due to in part to better than normal availability of small fish in nearby waters. The terns arrive at the airfield site in early April. By mid-August the terns have headed south to Mexico and Central America. 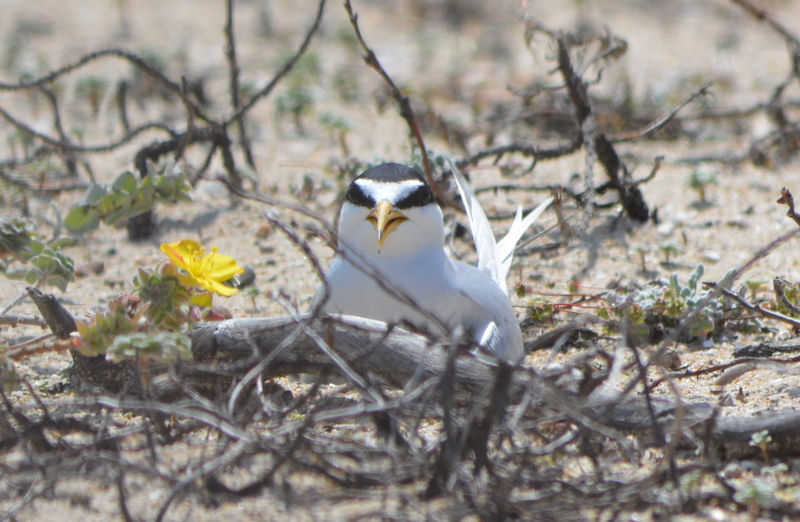 Least Tern adult with two chicks – June 2014. Viewed through chainlink fence. Alameda’s nesting colony of endangered California Least Terns has a new government landlord – and a secure home for the future. 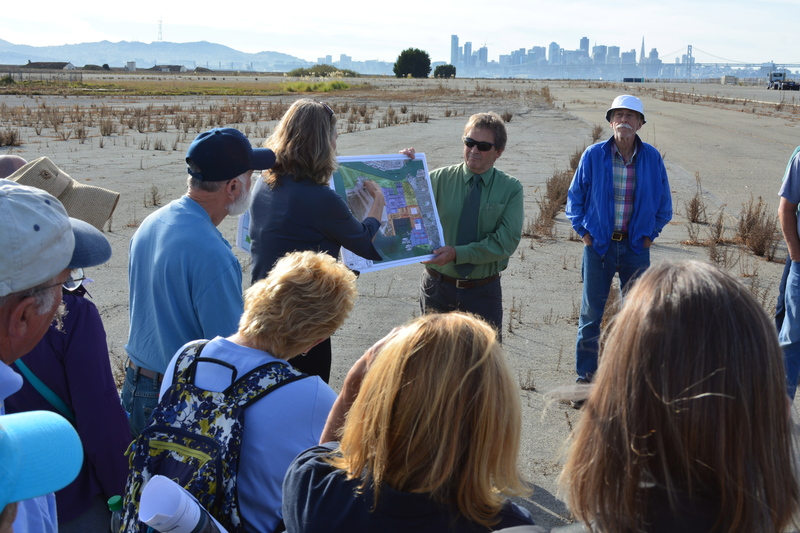 After years of negotiations, the U.S. Navy transferred 624 acres of its former airfield at Alameda Point to the Department of Veterans Affairs (VA) on Monday, November 3. 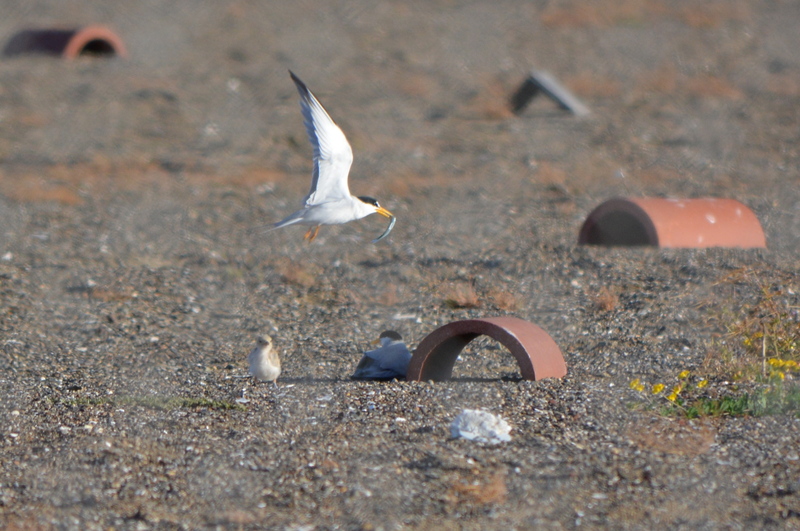 Least Tern chick, adult with fish, and resting adult, next to tile used for shelter, June 2014.